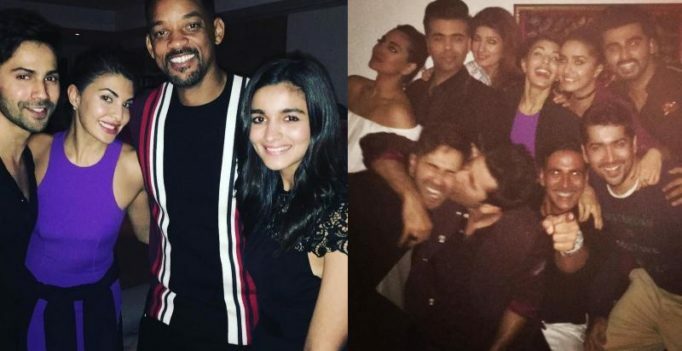 Bollywood stars had a great time at Akshay Kumar’s bash, where Hollywood star Will Smith also made an apperance. Mumbai: When Akshay Kumar, who was celebrating the success of his recent film ‘Rustom’, learnt that Will Smith was also in Mumbai, he decided to invite the Hollywood star over to his party. Smith happily obliged and landed up at Akshay’s residence late Sunday night. The grand bash was attended by the who’s who of Bollywood such as Akshay’s mother-in-law Dimple Kapadia, Sonam Kapoor, Alia Bhatt, Sidharth Malhotra, Sonakshi Sinha, Jacqueline Fernandez, Varun Dhawan and others. As soon as the news about Hollywood sensation Will being at the party got out, the entire Bollywood poured in to chill with the American star. Everyone wanted to catch a glimpse of the actor and hangout with him, who enjoyed himself surrounded by Indian fraternity. While we saw what happened outside Akshay’s residence, here are few inside pictures from the much talked party, which was also attended by Shraddha Kaopor, Ranbir Kapoor, Arjun Kapoor and directors Karan Johar, Rohit Dhawan, Ayan Mukerji and Esha Gupta. Looking at the pictures, the stars definitely had a gala time at the bash!